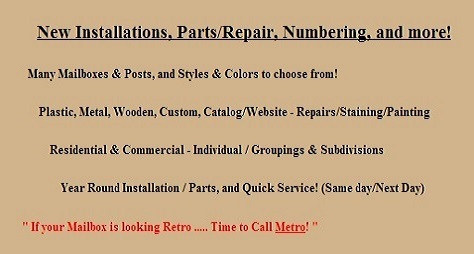 A New Mailbox and Post - Adds curb appeal & value - [Quick Service] - 2 yr Warranty! $225 - "Wood Post" - Standard Metal Box - ? $225 - "Wood Post" - Standard Plastic Box - ? $275 - "Wood Post" - Large Metal Box - ? $275 - "Wood Post" - Large Plastic Box - ? $300 - "Wood Post" - Jumbo Metal Box - ? $300 - "Wood Post" - Jumbo Plastic Box - ? **** - "Rubbermaid" - More Items - Ask! 1-Material for Mailbox - Wood/Plastic/Metal? 4-Color of Mailbox / Post? 5-All in one - Plastic or Metal Mailbox and Post? 6-Combinations - Wood/Metal post with a Metal/Plastic box? 7-Price Range for Mailbox / Post? Snow Plow Damage? Rusted? Dented? Vandalism? Vehicle Damage? Rotting Post? Loose Post / Box? Leaning, Shaky, or Unlevel Post / Box? Numbers Peeling, Cracking, or Missing? -- Or maybe it's just time for a New, or a Different one? +$40 - Travel - 25-35 miles from office. More? $??? Repairs - May require New Parts! Q - When can you Install our Mailbox and Post? A - As soon as Same Day, or Quick Service! - Special Orders may take 7-10 days for shipments to arrive, and a *Special Order Charge. Q - Will the Mailbox and Post be installed to Postal Service Standards? All Products we install are approved by the post office, from the Best Manufacturers, and Brand names. And Servicing of many Manufacturers Parts, and Warranties. Q - Do you drive out to take a look at our mailbox and post first, or do you have a showroom, or retail display? A - No, we don't usually drive to a mailbox and post to look at it first, since many installations are similar. We Install Postal Products that we can quote, and arrange by phone, and from our website. We can also look at pictures you send thru email. You can use our Mailboxes List, or a Manufacturers Link, or other links to help you decide on products, and accessories. Q - What Cities do you Install in, and how far do you Drive to Install Mailboxes, Posts, and all related work? A - MetroMailbox.NET is in Farmington, MI and we Drive up to approximately 45 minutes from our office. *Travel Charge for over 14 miles distance one way. White Lake - Whitmore Lake - Rochester - Rochester Hills - Troy - Royal Oak - Ferndale - Berkley - ( And More Cities - Call!) - Servicing Oakland / Wayne County, and Parts of Macomb. Q - Can you install a mailbox and/or post that we choose, that we will have shipped to our location, or one we bought, or acquired already? ..... Special Order Fee of $35 for aquiring products that are not stocked, or local. A different order Fee can be determined for more than 3 items, or heavy/bulk shipments ordered. There is a lot of time/resources/knowledge in Ordering of Items/Parts, and the Pickup/Gathering/Safe Storage of fragile products, and Tracking/Waiting for/Scheduling, and Transport of Parcels!